The Fish Market: Inside the Big-Money Battle for the Ocean and your Dinner, by Lee van der Voo, St. Martin’s Press, New York, 2017. I am utterly amazed by this book. 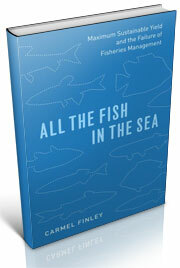 Lee van der Voo has done something I thought was impossible, to write an understandable book about fisheries catch shares and have it be both accurate and interesting. There is voluminous literature on catch shares in many, many academic journals, all of it couched in the dense vernacular of social scientists, with their irritating acronyms and obtuse theoretical constructions. Even for somebody with an interest in the subject, it can be heavy lifting. But van der Voo took it from the other direction, from the individual people who are involved in catch shares, and then worked back through their stories to show what catch shares has meant for some fishermen and their communities. Environmental groups sold the idea of catch shares to corporations and politicians, promising private ownership of the resource would bring about sustainable fishing. She paints a powerful picture of how catch shares are changing fishing. By keeping her focus so tightly on people, she does not place catch shares into their wider ideological foundation, neoliberalism. Neoliberalism is a political economic theory that supposes that human well-being can best be achieved by maximizing entrepreneurial freedoms within a framework of private property rights, individual liberty, unencumbered markets and free trade (Harvey 2007: 8). The preferred neoliberalism option within fishing nations has been systems of catch shares, where individual fishermen or other groups are given rights to a certain percentage of the total catch. Catch shares have increasingly been implemented in Norway, Iceland, New Zealand, and Australia. The Canadian halibut fishery switched to it in 1991. After a long history of strenuous objections, a system of catch shares was implemented in several American fisheries, starting in the 1990s. Van der Voo’s book describes the outcomes of several of these catch sharing programs, by interviewing people who have been involved; some were successful, others were not. It was an absorbing read, but the conclusions were vague and unclear, not distinguishing that catch shares can be part of a governmental system, but that in some areas without strong governing body, will lead to inequities. Fishing has always been a hard and difficult way to make a living. 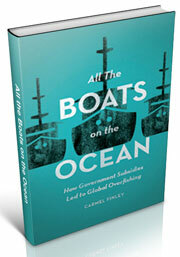 For centuries, fishermen have been poor, and in many areas of the world, they continue to be. 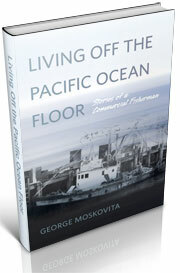 For a first person account of modern trawling, check out the memoir of pioneering Oregon trawler George Moskovita. I found her book and her methods fascinating, a reminder of the importance of good and clear journalism in telling accessible stories about complex and important topics. And as a newspaper reporter turned historian, it’s nice to see that stories about people still have the ability to move readers. This entry was posted in Fisheries policy, Fishing, George Moskovita, Marine Policy, Maritime History, Ocean fishing, Overfishing, Pacific Fishing History Project and tagged Neoliberalism. Bookmark the permalink.